Since Mark and I had been living in South Carolina, we desired a nice warm honeymoon location, a place that wasn’t overly hot, and a spot that neither of us had ever been before. We tossed around locations like Sonoma Valley in California, but one of us had been there before. Mark suggested Canada, but that didn’t really sound like an exciting honeymoon location. 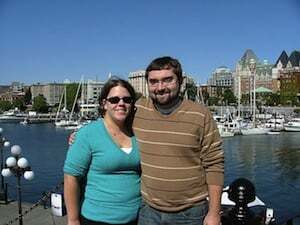 But on a plane ride back from a friend’s wedding, I discovered an article in a travel magazine detailing a three-day trip to Victoria, British Columbia. After reading about the beautiful climate, exciting attractions, relaxing atmosphere, and artsy vibe, I was sold. Neither of us liked big crowds or were crazy party people, so the more we learned about Victoria, the more we knew it was our type of place. After learning about the new honeymoon registry trend, I looked into different honeymoon registry sites. Traveler’s Joy won out because it had it all. It was simple, there was no setup charge, it featured the lowest fees for us and guests, and it access was super easy for all users. We started out simply by registering for places to see and eat. However, after seeing how quickly our guests took to the idea, we expanded our registry to include popular landmarks, more food and restaurant options, additional indulgences such as a couples massage, plus other “mundane” things like traveling fees and taxi/ferry rides. With both of us being teachers, Traveler’s Joy allowed us to register for things we might not have been able to accomplish on our own. Courtesy of my parents, we stayed at the Royal Victoria Suites. As soon as we set the dates for our honeymoon, I contacted my parents because they had a timeshare. Growing up, anytime that my family went on vacation, we did so through their timeshare points. So as part of their wedding gift to us, they allowed us to use their points for our honeymoon. The Royal Victoria wasn’t your typical hotel but rather a set of eight suites spread out between two floors. The Royal Victoria was more like a set of hip, urban apartments than your typical hotel room. The most interesting thing about the hotel location was that it was right next door to a gentleman’s club. Needless to say, our arrival to the hotel was quite interesting! We had a long first day of travel due to delayed plane flights and missed flights. We nearly missed our ferry to the island, too, which meant we didn’t even arrive at our hotel until 10 hours after we were scheduled to. As we pulled up to our destination at midnight local time, we stepped out of the cab into a sea of pumping bass music from the brightly lit club. Men were standing around waiting for our cab and a couple of homeless ladies began asking us for money. Thus, we were quite dubious about where we were staying and what we had gotten ourselves into. But other than that odd arrival, we loved our quaint loft and downtown hotel location. It had a beautiful view, easy walking distance to shops, food, downtown locations, the bay, and so much more. Our most memorable experience on the honeymoon was definitely our late arrival to the hotel, but from there, we enjoyed every event, activity, meal and shopping destination that Victoria had to offer. Our first day there, we slept off the jet lag, explored the sites around us, and had the best meal topped off by prime seating by the windows with a view of the beautiful bay and Empress hotel. Our overall favorite activity included a three-hour whale watching tour and couples massage. The whale watching was an activity neither of us had ever experienced, and it was an amazing site to see. 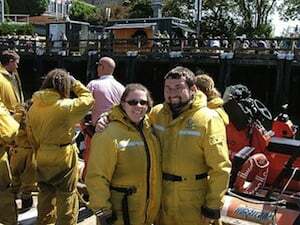 We were all bundled up like Randy Parker in “A Christmas Story.” During our trip, we were fortunate enough to see a pod of whales plus local sea lions. Our second favorite experience was the couples’ massage – mainly because it helped us begin our honeymoon and get relaxed. We also scored an amazing deal by getting two one-hour massages for the price of a half-hour massage. Overall, our honeymoon cost us about $2,000, though we were able to use free airfare points and our parents’ timeshare, which helped save some big time dollars. We would definitely recommend the destination to any other honeymooners. It was an amazing experience, a beautiful city, and a great combination of a relaxing and bustling city. Victoria is Vancouver’s capital, it’s well tended and the climate stays fairly mild all year long. Because of its unique location, Victoria’s weather never drops below 40 degrees or gets warmer than 80 degrees, making it an ideal vacation spot.